Global labor productivity is not slowing down; but it is slowing down, in many countries. I smoothed the time series, country by country, using the Hodrick-Prescott filter (smoothing parameter = 100). The last data point available in the dataset is for 2013, but the last data point I use is 2010, to mitigate the end-point problem of one-sided filters such as Hodrick-Prescott. The impression I have received lately is that productivity has stagnated or declined, but all the evidence seems to come from the U.S. or Western Europe. So the first thing I wanted to know is: Has labor productivity growth, for the world as a whole, declined? 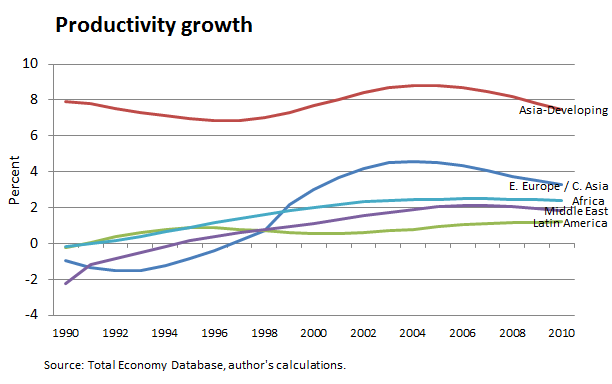 This chart reveals Fact #1: World productivity growth has not slowed down significantly. Actually, average productivity growth was faster in 2000-2010 than in 1990-2000, although year-to-year growth seems to have plateaued in the second half of 2000-2010. The chart shows the year-to-year growth of labor productivity growth. Each regional composite is constructed as the weighted average of country productivity growth, using the levels of real, total GDP as weights. But both within developed markets and emerging markets output per worker is not growing as much as it used to. Among rich countries the deceleration is noticeable to the naked eye since the early 2000s, whereas in poorer nations the slowdown started in the mid-2000s. This (superficial) paradox is possible, of course, because the share of emerging markets in world output has risen. So, Fact #2: World productivity growth has managed to stay constant through the 2000s because more and more output comes from emerging economies, where the level of productivity growth is higher. 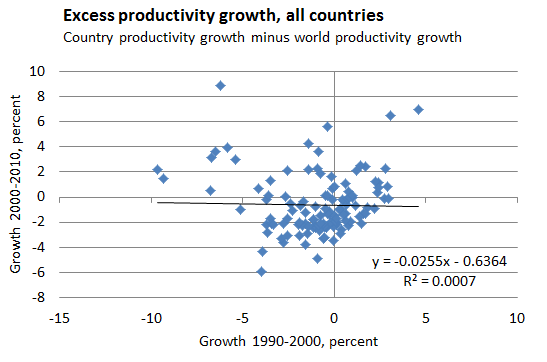 The map shows the change in average productivity growth, by country, from 1990-2000 to 2000-2010. 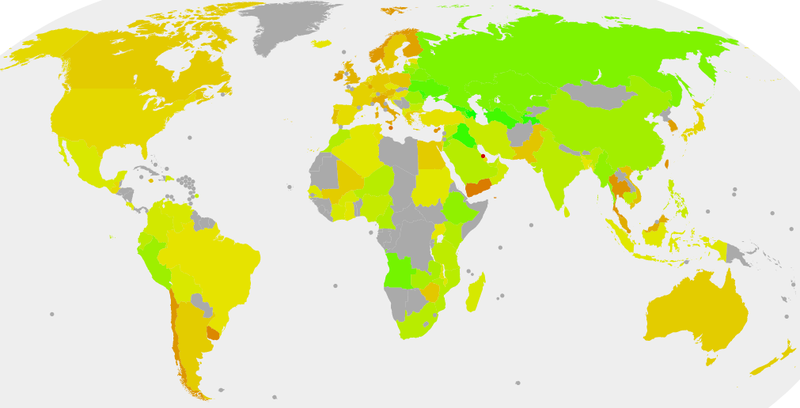 Source: Total Economy Database, author's calculations, http://gunnmap.herokuapp.com/. The chart shows the year-to-year growth of labor productivity growth. Each regional composite is constructed as the weighted average of country productivity growth, using as weights the levels of real, total GDP. The map and the time series reveal the (largely expected) Fact #3: From one decade to the next, productivity accelerated in every major emerging region, and slowed down in every major advanced region. The Asiaphoria paper by Lant Pritchett and Larry Summers made a lot of noise a while ago. In it the authors show that growth is not persistent in the long run: higher-than-average GDP growth in one decade tends to be followed by lower-than-average growth in the next. I wanted to know whether, from a casual observation of the data, that finding holds true for labor productivity, over the past two decades. 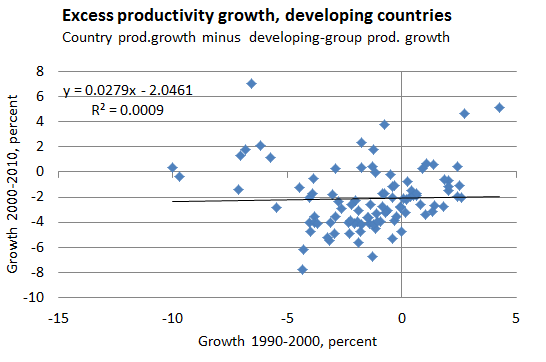 On the following chart, the vertical (horizontal) axis shows the difference between country-specific productivity growth and the world productivity growth in 2000-2010 (1990-2000). The chart shows, in the vertical axis, the difference between a country average productivity growth in 2000-2010 and the world average productivity growth in the same period. The readings along the horizontal axis are analogously defined. 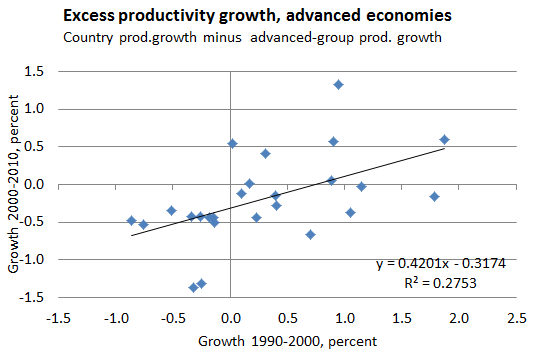 The chart shows, in the vertical axis, the difference between a country average productivity growth in 2000-2010 and the average productivity growth among advanced economies, in the same period. The readings along the horizontal axis are analogously defined. 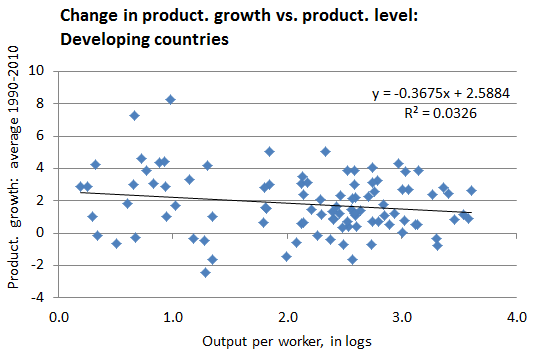 The chart shows, in the vertical axis, the difference between a country average productivity growth in 2000-2010 and the average productivity growth among developing economies, in the same period. The readings along the horizontal axis are analogously defined. Productivity growth is in fact persistent within advanced economies, but there is no sign of persistence or reversion to the mean within emerging economies. And so we have Fact #4: Within emerging economies, there is no significant persistence or reversion-to-trend of productivity growth in the long run. 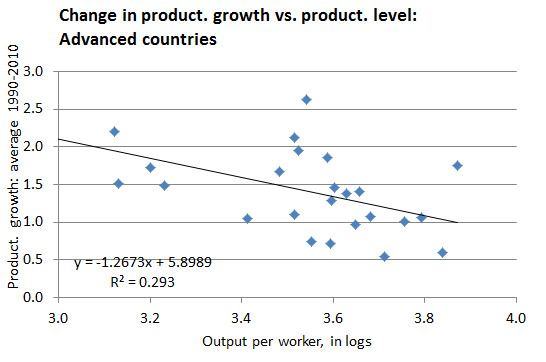 Within advanced economies, there is some evidence of persistent productivity growth. Finally, I wanted to see if there appears to be unconditional convergence in productivity. 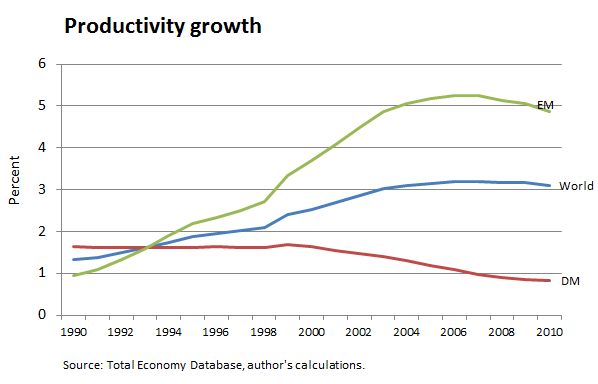 This chart shows the average growth of productivity in 1990-2010 vs. the level of productivity in 1990. 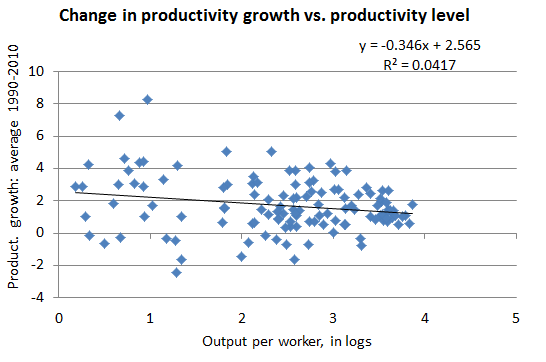 Unconditionally on stage of development, there is little relationship between level of productivity and subsequent productivity growth. But there are differences conditional on stage of development. 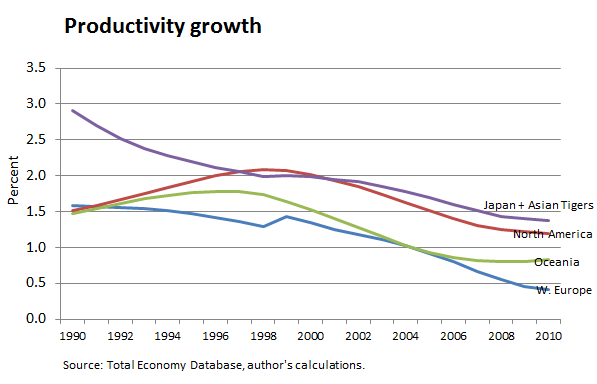 The chart shows, in the vertical axis, the average productivity growth in 1990-2010. The horizontal axis displays the log of the level of productivity in 1990. And that leads me to Fact #5: Within advanced economies there seems to be productivity convergence over the period 1990-2010. That's not the case, however, for developing economies.